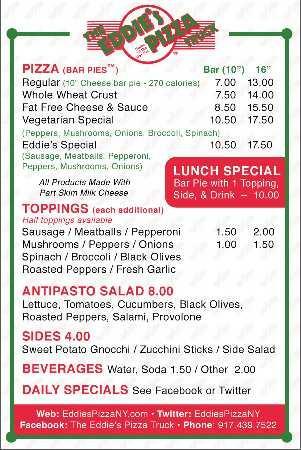 Three months ago we heard that a new pizza truck was going to be hitting the city, and it looks like we’ll finally get to try it out next week. 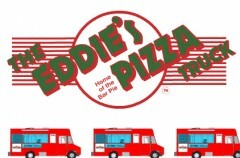 Next Thursday, Eddie’s Pizza Truck will be hitting the streets, and they will be celebrating their opening day with 100 free slices, but of course we need to wait until they tweet out the final location @EddiesPizzaNY. (Although a little birdie told us that if all works out as planned the free pizza day giveaway will in fact be in Midtown.) I may have failed in my attempts to get pizza from their bar in New Hyde Park, but I will succeed in eating pizza off their truck. Promise. Check out the truck’s menu, after the jump. Posted by Blondie at 8:45 am, June 4th, 2010 under Eddie's Pizza Truck.